Australian Quilters Companion recently published Issue No.4 of Great Australian Quilts. This particular issue includes interviews and quilts to make from not only quilters well known to members of The NSW Quilters' Guild Inc, but also a quilt by our current President, Cath Babidge. Cath has her original quilt "Boab Tree" showcased, with piecing and applique instructions included. As a member of SAQA Oceania, Cath has donated a quilt that pays homage to the Australian Wagga, and this will be auctioned at The International Quilt Festival in Houston. However, Cath, after three busy and productive years, will be going off Guild Management Committee at the October General Meeting of The NSW Quilters' Guild Inc on 19th October. This means the President's role will be vacant. All committee positions will be declared vacant, thus should you be interested in nominating for a position, then please contact the President if you would like further details. Time to share your quilts! Our next Friday Showcase will involve the sharing and appreciation of quilts by any members who may have finished a recent quilt, or even those wishing to a review an oldie with us all! Quilt sizes, styles and stories will be a "Lucky Dip" for all those in attendance. Please don't be shy about joining in, as we all love to hear about, and see a new (to us) quilt. I'm nearly 30 and really faded . . . can I still come? Members of the Quilters' Guild of NSW Inc who are fascinated by the history and concept of Friendship Quilts will be enthused by the upcoming meeting to be held by the Quilt Study Group. Karen Fail, author of Between Friends - Quilts to Share will talk about the early history of Friendship Quilts and their roles in the lives of quilters. 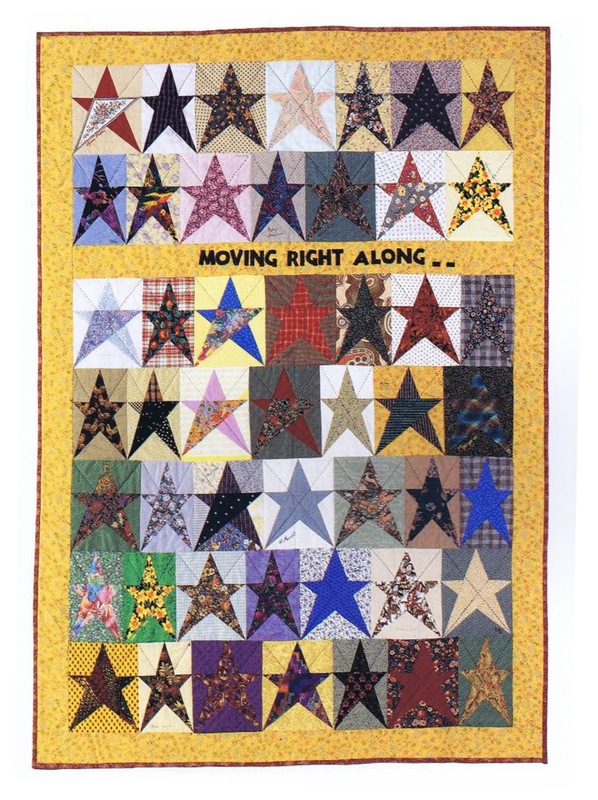 One of the beautiful quilts to be viewed from her collection will be Karen's own 'Charming Stars', a 'Friendship Quilt' presented to her by other Guild Committee members upon completion of Karen's term as President of the Guild. Like all friendship quilts, the story of this quilt holds its own special meaning. This quilt reminds Karen of the exciting time she spent at the helm of an expanding and creative guild, and her gaining of the new friends with whom she shared her passion. It will always be a special quilt for Karen. Attendees are invited to bring along their own examples of Friendship Quilts and/or Group and Collaborative quilts to show to the Quilt Study Group members and friends. 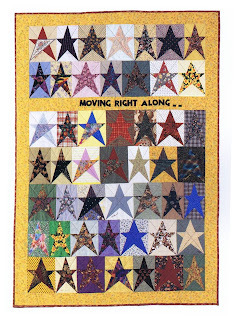 Perhaps there is a "Birthday-block" quilt to bring along, "Round Robin" quilts from a quilt group or family signature-block quilts, made for a commemorative family moment or celebration. As always, it will be the story behind the quilt that will have all members fascinated. Free entry to The Powerhouse Museum and afternoon tea will be provided. Following on from the excitement of their recent 30th Anniversary Quilt Show, Epping Quilters are forwarding interested quilters an invitation to join their creative group. If you are interested in joining a patchwork and quilting group then please feel free to attend their Open-Day to see them "in action" and share a great morning tea. They will make all attendees extremely welcome at this light-filled and lovely meeting venue. A Spring Quilt Show worth visiting will be the one that Wentworth Quilters have been happily working towards. Being held over 2 days in September, all are invited to attend if in the Guildford area. Wentworth Quilters have been exhibiting for 22 years now, so there will be wealth of creativity, quilt construction knowledge, design and wonderful colour to be enthralled with, at this, their 11th exhibition. Spring is definitely in the air when viewing the beautiful applique quilt being presented by Arcadian Quilters Inc as their Charity Raffle Quilt this year. Since this image was taken, the members have been working enthusiastically to quilt it, as well as organise their Spring Quilt Show. 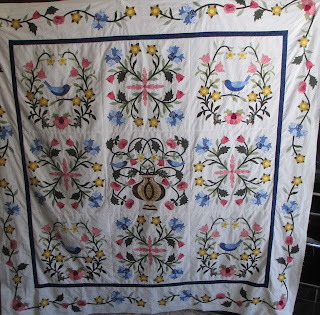 Special Features : There will be many beautiful quilts on display, supported by Traders stalls, members craft and gift stalls, and a delightful cafe to tempt attendees to stay a little longer to view all of the quilts exhibited. All proceeds from this exhibition will go to local charities. To celebrate 30 years of involvement in quilting pursuits, members of Singleton Quilters Inc have been enthusiastically planning a Quilting Anniversary Extravaganza! At Venue 1 in Singleton, there will be a special theme showcased : "Then and Now", where a history of the group will be displayed. Proceeds from the raffle will aid the local Mercy Nursing Home. 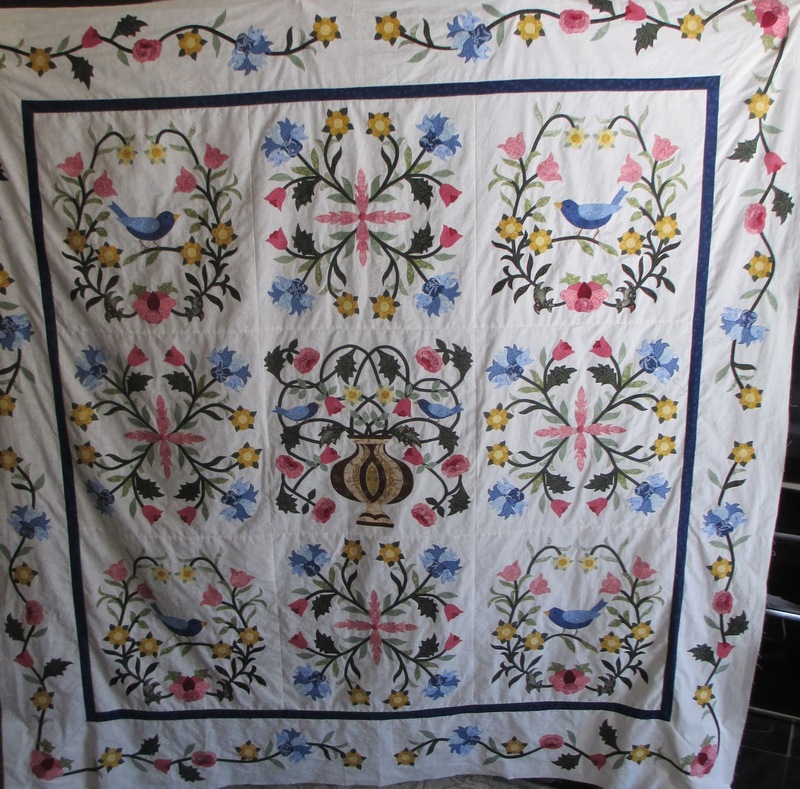 Venue 2 will display quilts and needlework from ladies attending Busy Needles classes. 'Busy Needles' are celebrating their 10 year anniversary. Both of these venues are just a short walk from each other. Venue 2 is The Anglican Church Hall, Goulburn Street Singleton. Epping Quilters Celebrate 30 years! Members of Epping Quilters Inc will be supporting Ovarian Cancer Australia when they hold their 30th Anniversary - Celebration, Quilt Show this weekend. Being held at The Don Moore Community Centre in Carlingford, attendees will view a delightful presentation of member's quilts, Raffle quilts, gifts stalls and Traders' areas. Refreshments will be available, and plenty of seating for weary legs! Come along and support these creative quilters as they celebrate a milestone in NSW Quilting and Patchwork community involvement.